Frost can spell serious damage to tender plants, especially if you live in an area where frosts are uncommon, they pose a real threat to plants that are used to temperatures above freezing. 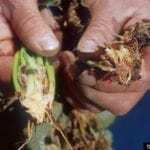 Even if your climate experiences cold winters, a single frost can come late in the spring or early in the fall to kill your tender plants well before their time. Keep reading to learn more about protecting plants from frost. Keeping plants safe in frost means being vigilant about the weather. It’s always a good idea to stay as up to date as you can on current conditions in your area, which will give you the head’s up as to when frost may be expected. The best frost plant protection methods are dependent on the length of time cold temps will remain, how low they will go and, of course, the types of plants you have. These are tips to protect plants from frost if temperatures are projected to dip below 32 F. (0 C.) at night, but not much lower. They’re short-term safety measures that give your plants a few extra degrees to make it through the night, not winter-long plans. That being said, they can be quite effective for shorter periods of time. Water thoroughly. Wet soil retains warmth better than dry soil. You can also spray leaves with an anti-transpirant to prevent harmful winter loss of moisture. Cover with breathable material. Sheets, blankets, and towels thrown over the tops of plants can help them retain heat. If you cover your plants with plastic, hold it up with stakes – any parts of the plant that touch the plastic will be frosted. Hang lights in trees and bigger plants. A 100-watt bulb or a string of Christmas lights will radiate heat through the plant. Make sure your bulbs are outdoor safe, and not LED (LED does not give off heat). Move container plants. Cluster them close together to store heat better. Place them against the wall of a building, preferably a south- or west-facing one that will hold the heat of the day longer. Alternatively, you can bring them all the way indoors for the night. Wrap younger trees. Wrap the trunks of less mature trees in blankets to help retain heat. 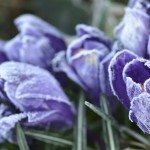 Nothing is guaranteed for keeping plants safe in frost, especially if the temperature falls lower than anticipated. If it’s autumn, pick everything ripe the day before the frost, just in case.